This is my run-up-to-Christmas post. Stop reading now if you wanted to read a fluffy article about the importance of family and being together in the festive season – and presents. You’ll be disappointed. This is the culmination of a few weeks’ worth of observations and opinion-forming. I’ve never been a huge fan of Christmas, since my parents split up on Boxing Day when I was ten years old – but let’s not let personal experience get in the way of truly rigorous analysis. Sometimes my blog posts, to put a very grand spin on things, are like weeks’ or months’ worth of preparation (or, gestation), that eventually result in the birth of an idea (not in any kind of weird or inappropriate way). I’ve been thinking about this one for ages. Usually the time to write occurs whilst I am on my way to work, and if I don’t write the post down instantly, I’ll forget the words in a kind of creative stillbirth (not a real one). Walking between Waterloo and Holborn helps to stimulate my creativity, and I also see a lot of homeless people on the way. As the temperature relentlessly drops, and having any bare skin on show in the icy wind is unacceptable, I am struck by the fact that there are still so many homeless people living on the streets. Some of them sell The Big Issue – a magazine published on behalf of and sold by homeless or vulnerably-housed people. I bought one today, although I’ve been meaning to for ages. I have to stop and hunt through my bag for my wallet, so naturally that’s an excuse not to buy one, and I don’t always have cash. This week’s edition touches on one of the topics I’ve been thinking about: the consumerist nature of Christmas and of life in general. I didn’t realise that the Christmas Big Issue costs £3 – 50p more than usual – and it seems that the vendor was too polite to correct me, so I accidentally underpaid him. Luckily, I know where he works, so I can find him tomorrow. As I write this, someone has just sent me a code for a free six-month trial of Amazon Prime – next-day delivery on all items – which I’m ashamed to say I did not turn down. This just shows that human beings – including myself – will usually take the easiest and most beneficial option available to them, and not necessarily live up to their own ideals. Christmas can also be fun, and I wouldn’t want to be the one to tell small children that they won’t be getting any presents this year. It’s a topic that has been done to death, but this year is the first time I’ve been aware of Black Friday’s consumer dash. The media coverage was quite shocking, along with the grainy phone videos of people in shops literally fighting each other. This witty article by James Dyke on academic news website The Conversation aptly compares it to a zombie attack. The context behind Black Friday is it’s the first Friday after Thanksgiving in the U.S., which means it is now widely regarded as the beginning of the Christmas shopping period. Retailers slash their prices and a huge sense of anticipation greets this largely made-up day. Ironically, it’s actually rooted in an economic crash in the 1800’s. Wikipedia mainly focuses on the social significance of Black Friday in the U.S., but it’s now reached British shores. Police were called to the Surrey Quays Tesco Extra, my local Tesco, among others, due to overcrowding. What I want to know is how people can fight each other over a flat-screen television when there are so many people without a home? It’s hardly surprising that people turn into animals in this kind of hyper-consumer environment, in the midst of the crowds, faced with products that have been relentlessly marketed at them wherever they look. Consumer bullying is excessive. My heart sank when the extremely popular Frozen song, ‘Let it Go’, sung by children everywhere, was used on a Christmas advert for Virgin Media. Well done, Disney – still getting ‘em young. We’re trained from a young age to value “stuff”, and treated as ‘consumers’ rather than people, or citizens. We’re then all emotionally blackmailed into spending money at Christmas in order to show how much we love each other. I’m not an economist, but I understand our capitalist model of economic growth is heavily dependent on the amount of money people spend on stuff – especially at Christmas. But this model is not sustainable– especially considering all the carbon emissions and waste that are produced every Christmas. Suddenly, it’s not so heartwarming. It’s up to the individual to break out of this vicious cycle, and become more mindful. Something I find particularly hard is how we’re only supposed to show how much we love our family and friends at Christmas, which is an exclusive inner circle restricted to a few individuals, and actually diminishes our connection to society as a whole. You could donate some money to a homeless charity instead of buying presents… but why don’t we? It doesn’t make quite as picturesque a scene as exchanging presents under the tree, but at least it really does mean something. Being anti-consumer a difficult position to hold at this time of year, not least because celebrating Christmas is so value-laden. The day is strongly associated with childhood traditions, as well as notions of family and belonging. Zen Buddhist, blogger and author, Leo Babauta, shares this inspiring set of tips on how to give thoughtful presents at Christmas that don’t cost a thing. My own goal is to be more mindful about the presents I’m giving – perhaps affirming my relationships in different ways – rather than heading online for a bargain. It’s always a tricky one. I combine homemade gifts with bought gifts, and try and put a ton of thought into each one, but of course, it can be hard. I actually start buying my Christmas stuff in the January sales, and then just pick things up through the year that I think people will like, that way it’s not so much of a mad dash in December, and I don’t spend a ton of money just for the sake of spending. Black Friday is such a weird concept, on Thanksgiving you’re supposed to ‘give thanks’ for all you have, and on the day after you cash that all in and battle in the aisles for a discount TV. It’s worrying that now Britain has a taste for Black Friday, it’s only going to get worse in the coming years. I definitely agree. I think that’s a good idea, because you want to show your appreciation for your loved ones and ultimately Christmas is a big deal, and so ingrained in our culture. Don’t get me wrong, I love the mince pies and dinners and decorations and stuff. 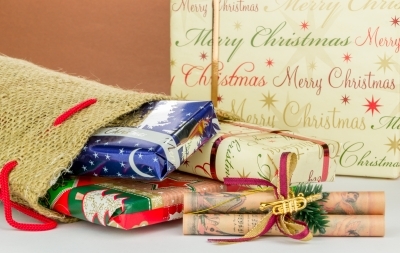 Do you think giving presents after Christmas makes a difference? I might have to make things for my family. I hate Black Friday.